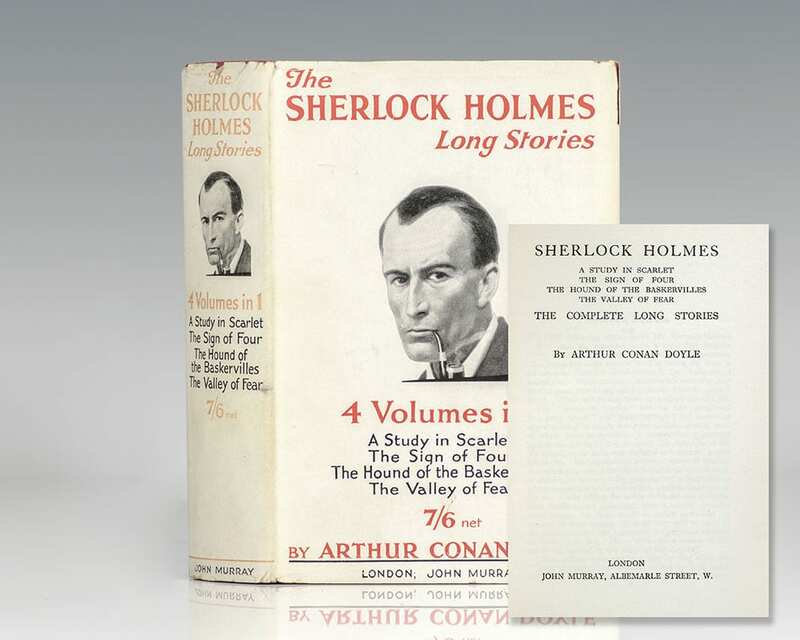 The Complete Sherlock Holmes Long Stories: A Study in Scarlet, The Sign of Four, The Hound of Baskervilles, and The Valley of Fear. 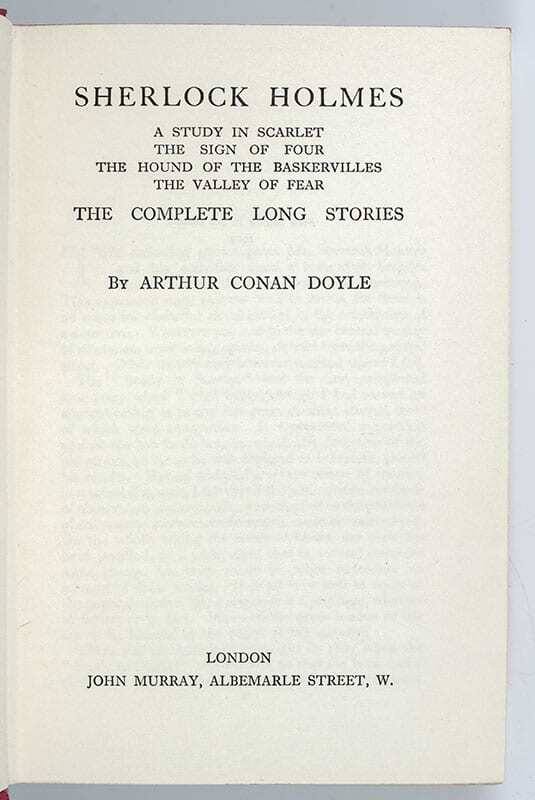 First edition of the first collection of Sherlock Holmes stories. 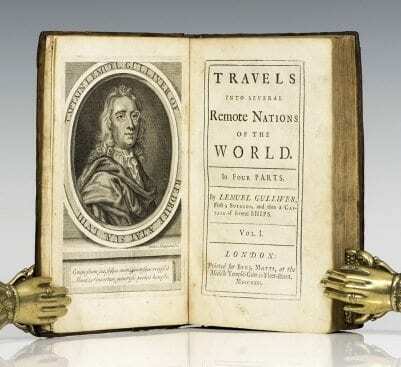 Octavo, original cloth, gilt titles to the spine. Original publisher’s advertisement laid in. Preface by Arthur Conan Doyle. Bookplate, near fine in a near fine dust jacket. A sharp example. The fictional private detective Sherlock Holmes became immensely popular with his first appearance in a series of short stories in The Strand Magazine, beginning with "A Scandal in Bohemia" in 1891. Additional tales appeared from then until 1927, eventually totaling four novels and 56 short stories. Widely considered a British cultural icon, Sherlock Holmes and his stories have had a profound and lasting effect on mystery writing, with the original tales as well as thousands written by authors other than Conan Doyle being adapted into stage and radio plays, television, films, video games, and other media for over a century. London: Hodder and Stoughton, 1912. First edition of Sir Arthur Conan Doyle’s “robust adventure story,” one of 190 large paper copies. Octavo, original cloth blindstamped with dinosaur footprints, gilt titles to the spine and front panel, pictorial endpapers, with eleven tipped-in plates with tissue guards including frontispiece portrait of Professor Challenger. In very good condition. Rare and desirable. Round The Red Lamp: Being Facts and Fancies of Medical Life. London: Methuen & Co, 1894. First edition of the author’s collection of medical detective stories. Octavo, bound in full morocco with gilt titles and tooling to the spine in six compartments within gilt raised bands, morocco spine labels, double gilt ruled to the front and rear panel, inner dentelles, all edges gilt, marbled endpapers. In fine condition. Housed in a custom slipcase. A very attractive example. Bristol & London: J. W. Arrowsmith, 1892. First edition of Doyle’s Napoleonic era action-adventure novel. Small octavo, original illustrated wrappers as issued, publisher’s advertisements. In very good condition. Housed in a custom half morocco clamshell and chemise case. The Works of Arthur Conan Doyle Including: Adventures and Memoirs of Sherlock Holmes, A Study in Scarlet, The Sign of the Four, The Refugees, Round the Red Lamp, Tragedy of the Korosko, and The White Company. London: Smith, Elder & Co, 1903. Limited Author’s edition of the complete works of Arthur Conan Doyle, signed by him. Octavos, 12 volumes, bound in full red morocco by Bayntun Bindery, gilt titles and tooling to the spine, gilt-turn ins, marbled endpapers, all edges gilt, twenty-four photogravures including frontispieces by Arthur Twidle, Sidney Paget, B. West Clinedinst, and W.B. Wollen. 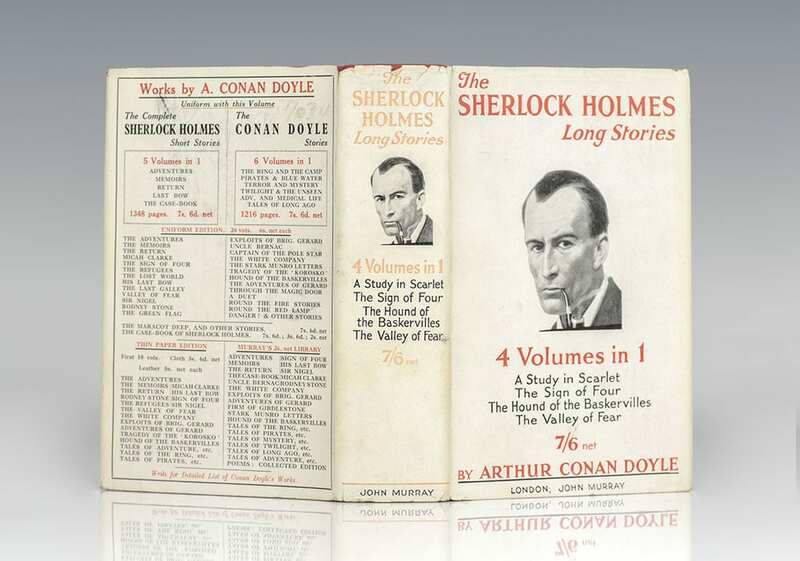 One of 1,000 sets signed by Arthur Conan Doyle, this is number 160. In fine condition. An exceptional set.